Karolyn, will you spend February titling all your January pieces?! 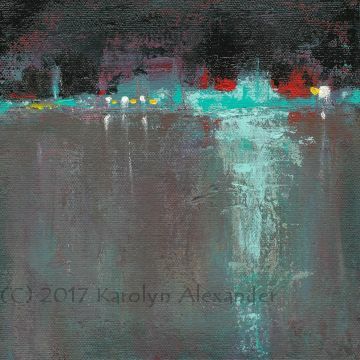 This piece has exquisite tension—on one hand, it calls to me to walk across the frozen harbor to the hustle and bustle and colors and lights and buildings and people and activity and music across the way; on the other hand, it invites me to be still, to stay in place, to tune in to spaciousness and know it. I go back and forth between those competing beckonings. Well done! I appreciate your thoughtful comment, Dotty! I always go back and look at my painting again after reading what you have had to say. To answer your question, some paintings already have titles; I sometimes don't post them because I like to hear what people say without knowing my title. Others may not have a title until I decide they are worthy of framing/exhibiting. And lastly some will sit in a box until I know what the next step will be for them.